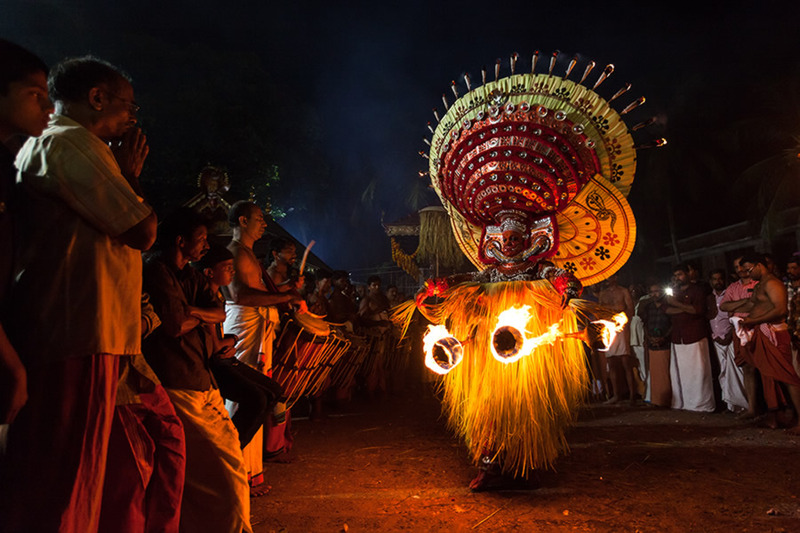 Theyyam-the ritualistic performance, which can be described as the most visible, spectacular art form of Malabar (Northern part of Kerala), associated with myths and legends. 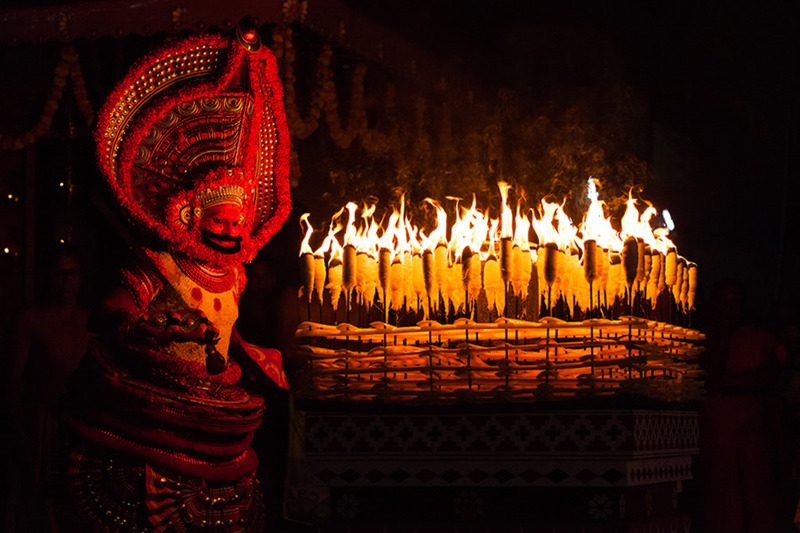 Theyyam can also be described as a form of worship consisting of rituals, colorful costumes and divine dance through which the gods are appeased and honoured. As a living cult with century old traditions, rituals and customs, it embraces almost all castes and classes of Hindu religion. 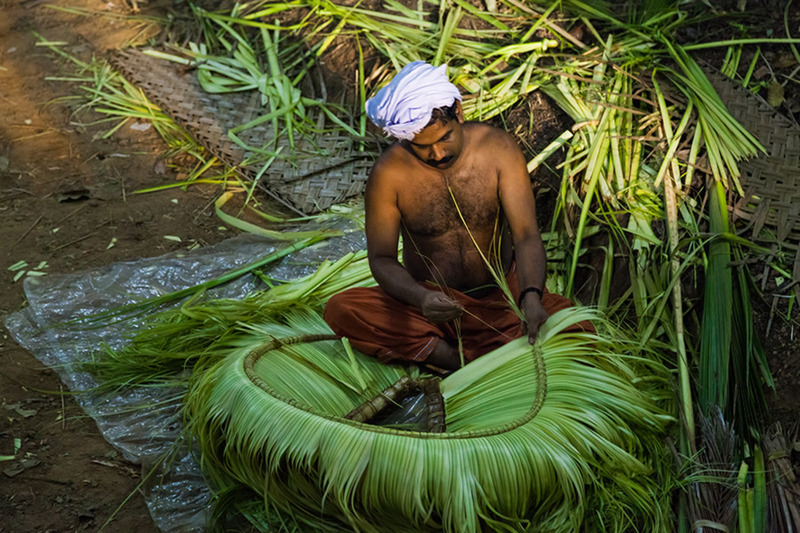 Its root can be traced back to 1500 years ago, and still preserve its Tribal and Dravidian features although the art form has evolved over centuries to form what can be called an amalgam of religious and spiritual traditions. 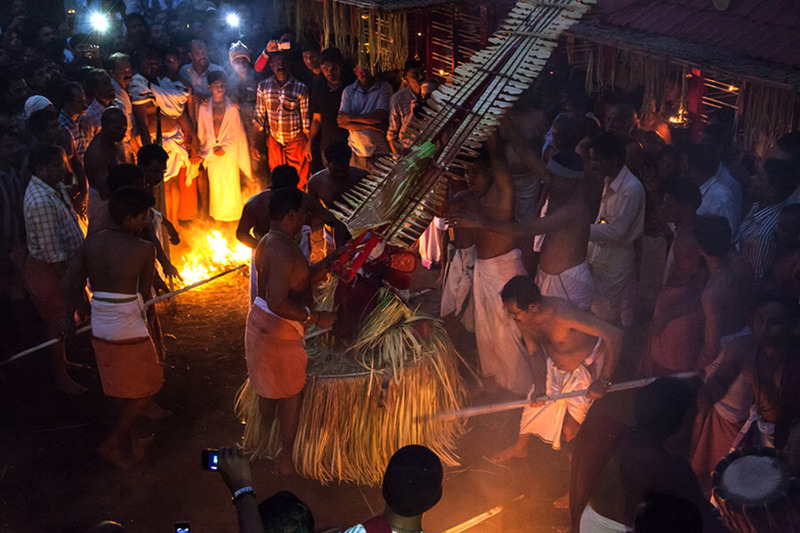 Theyyam is performed between mid-October /mid-November and mid-May/mid-June. This is the period between the completion of the year’s harvest and preparations for the next year’s harvest. 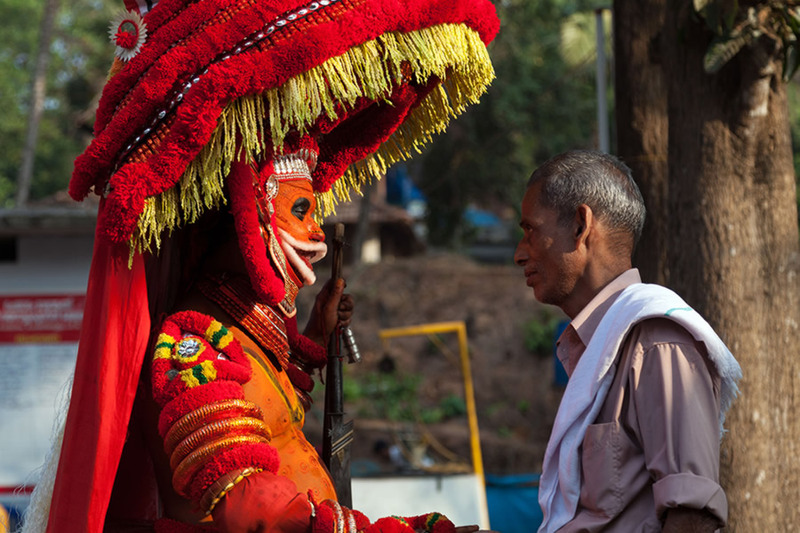 This period for Theyyam is the time for prayers for a good harvest, prosperity and general social solidity. 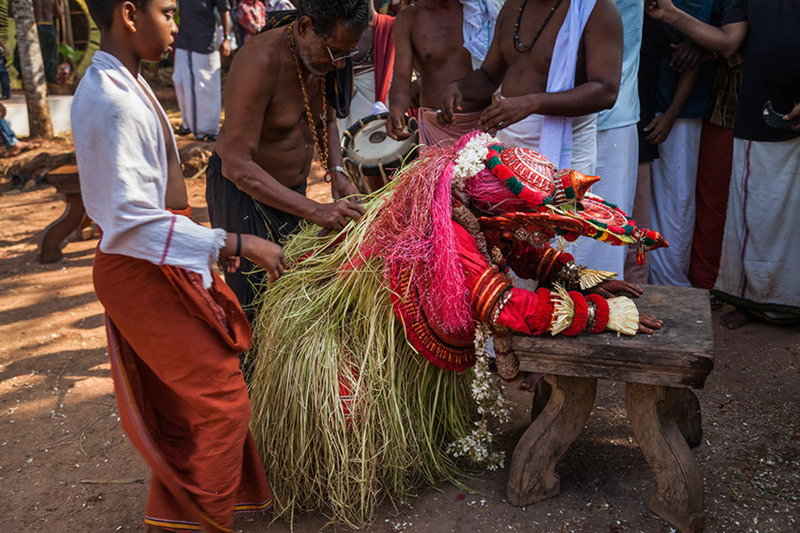 Theyyam ceremonies usually take place either within the precincts of a small shrine-usually called Kavu, Kazhakam, Muchilottu, Mundiya, Sthanam etc or in the yard of an ancestral house, or in an open space with a temporary shrine called pathi. 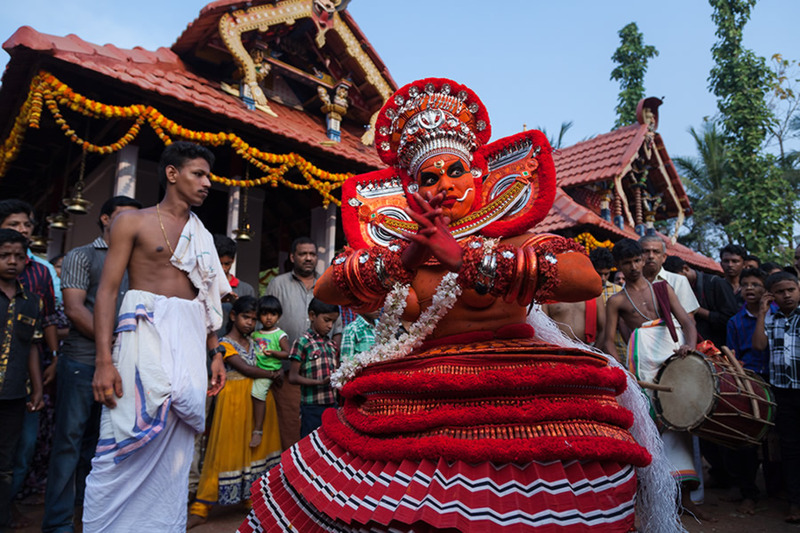 The costume as well as the facial make-up of each theyyam varies according to the role and myth of the form, which speaks volumes of the nature of the particular theyyam. 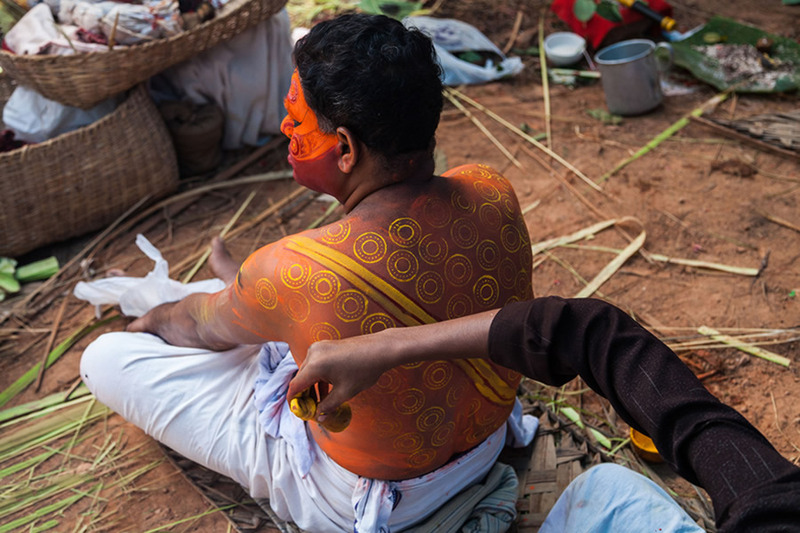 Using indigenous pigments and other materials the artistes themselves prepare most of the costumes. 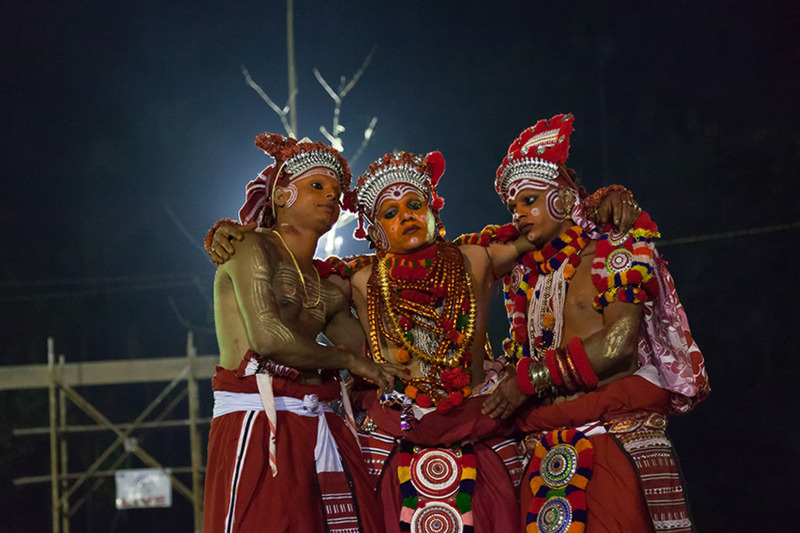 The costumes of Theyyam are made out of cutting and painting coconut sheaths in black, white and red patterns, fresh coconut fronds form skirts, fashioning breasts out of dry coconut shells and tying a red cloth around the waist. A performance of a particular deity according to its significance and hierarchy in the shrine continues for 12 to 24 hours with intervals. 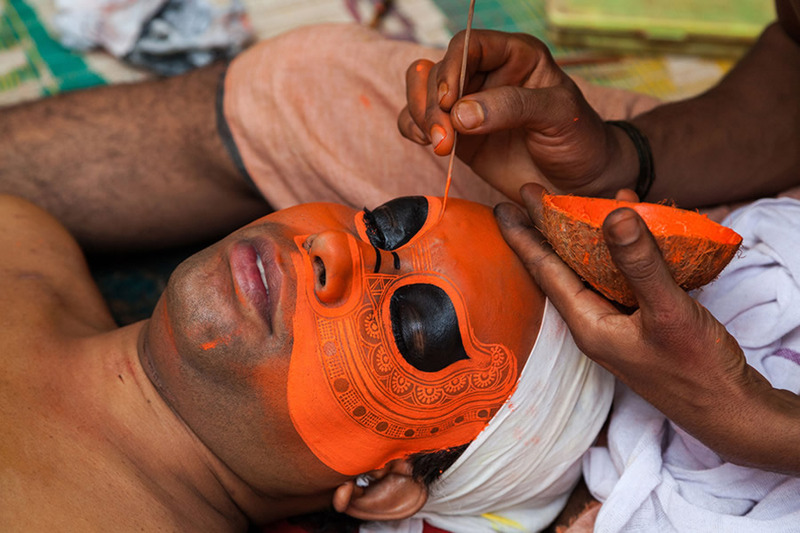 The chief dancer who propitiates the central deity of the shrine has to reside in the rituals. 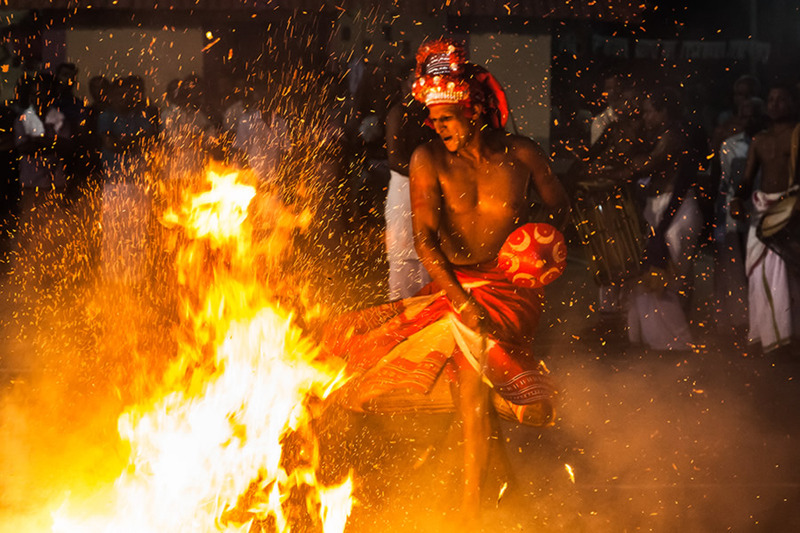 The first part of the performance is usually known as Thottam and Vellattam. In this prelude of thotam the performer wears no particular crown or full ornaments. After finishing this primary ritualistic part of the invocation, the dancer returns to the green room. Again after a short interval he appears with proper make-up and costumes. 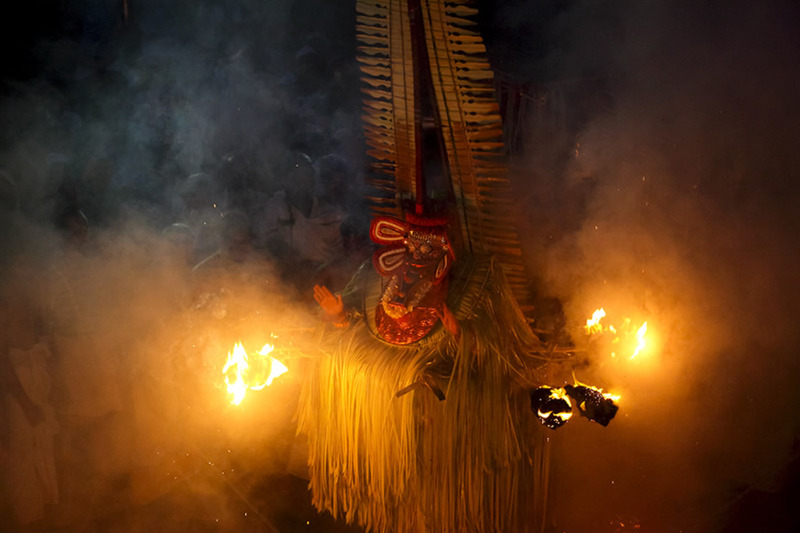 Then the dancer comes in front of the shrine and gradually “metamorphoses” into the particular deity of the shrine. 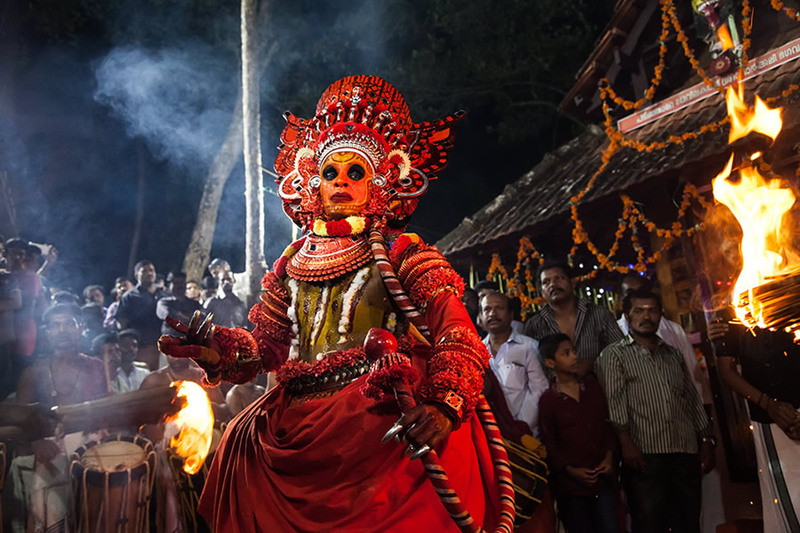 More than 450 theyyam forms depicting various deities exist in this cult that has become the cultural symbol of North Kerala. 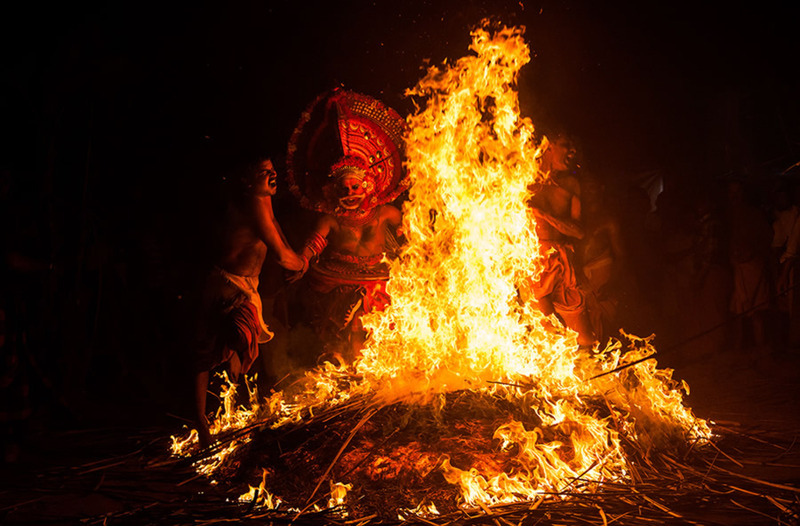 Theyyam reveals the human capabilities of abstraction, synthesis, and idealization; it describes social and economic activities and reveals practices, beliefs and ideas. It provides a unique insight into spirituality, intellectual life and cultural adventures. 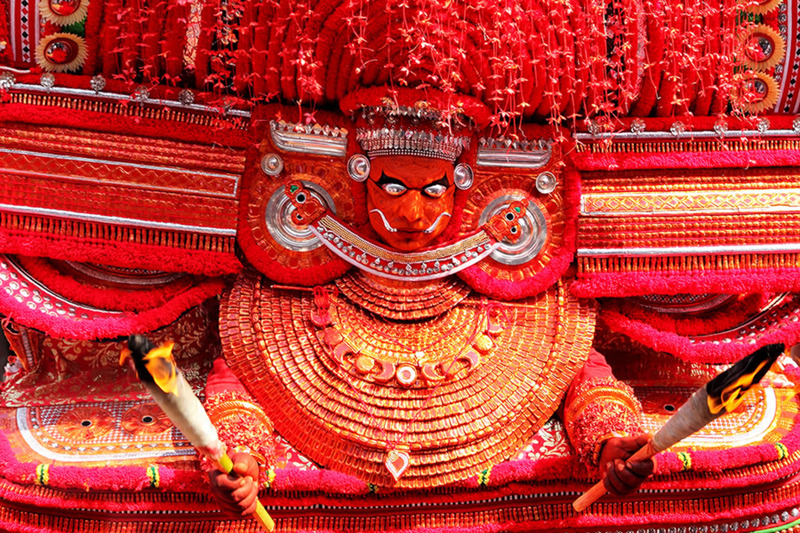 Since the theyyam performer, transforms to the status of a particular deity, theyyam is very much a divine dance. Invoking god or goddess in his body, he dances through the compound of the sacred space where deities are worshipped. 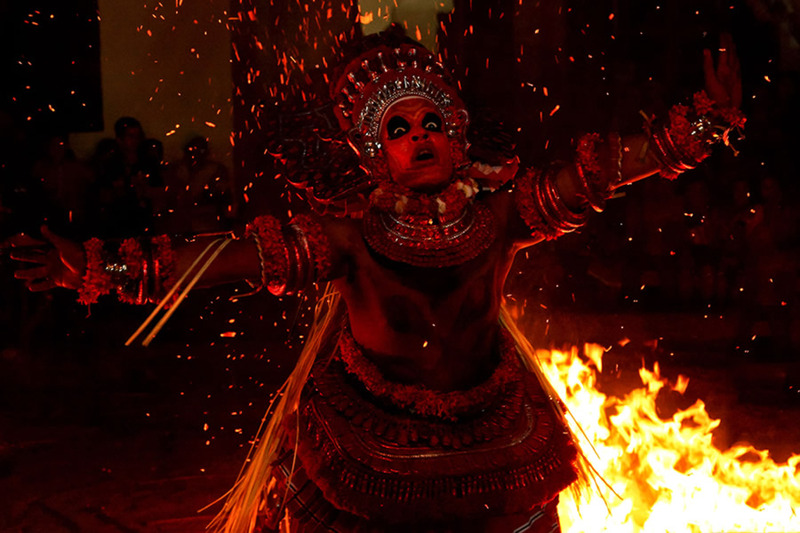 The dance is considered not for propitiating gods or goddesses, rather it is dance of the gods or goddesses themselves. 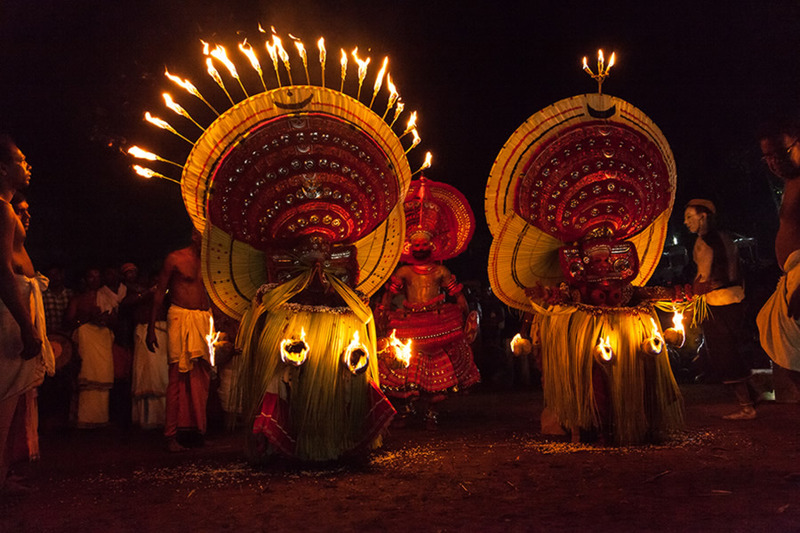 Scores of nature deities (including animals and trees), ancestors, village heroes and heroines, and gods and goddesses from Saivite, Vaisnavite and Sakti traditions of Hinduism form part of the pantheon of theyyam performance. The devotees present their personal problems and troubles to the deities and the deities give them counsel and blessings. 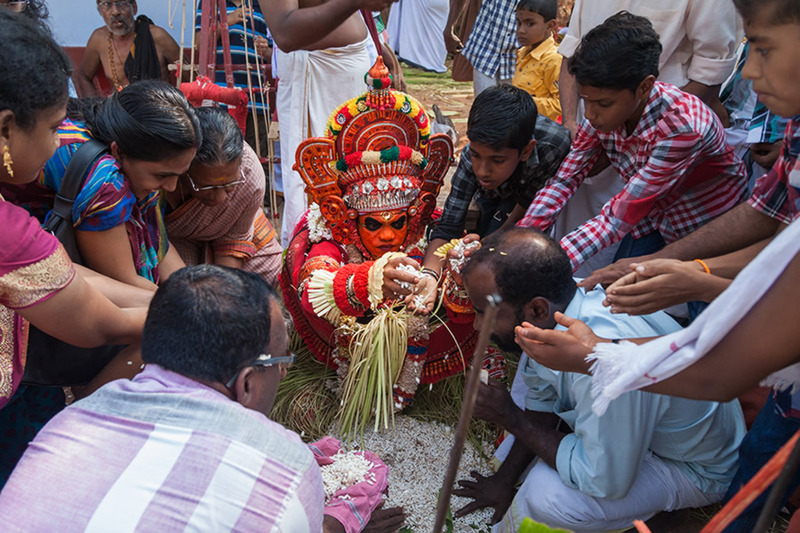 In support of this, experts point out that the deities are worshipped and propitiated for the blessing of fertility, for protection and security. There are powerful deities who ward off smallpox and other contagious diseases. 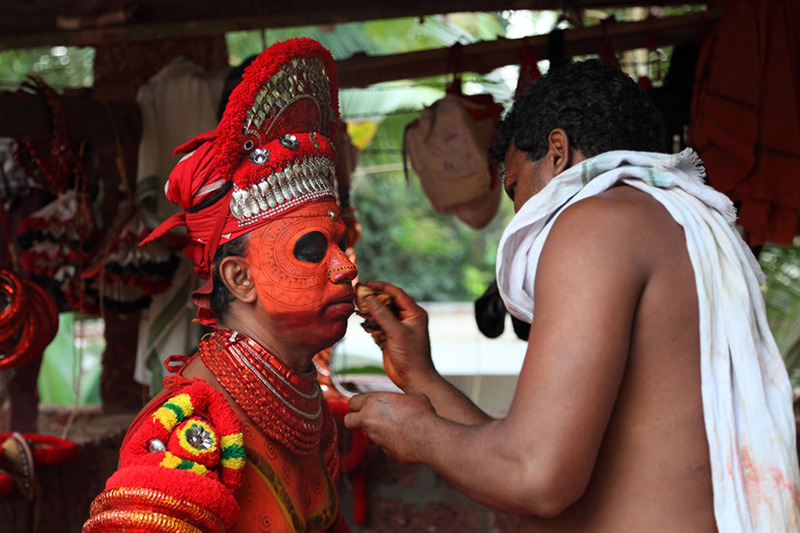 Theyyam ritual performances also provide judicial services. 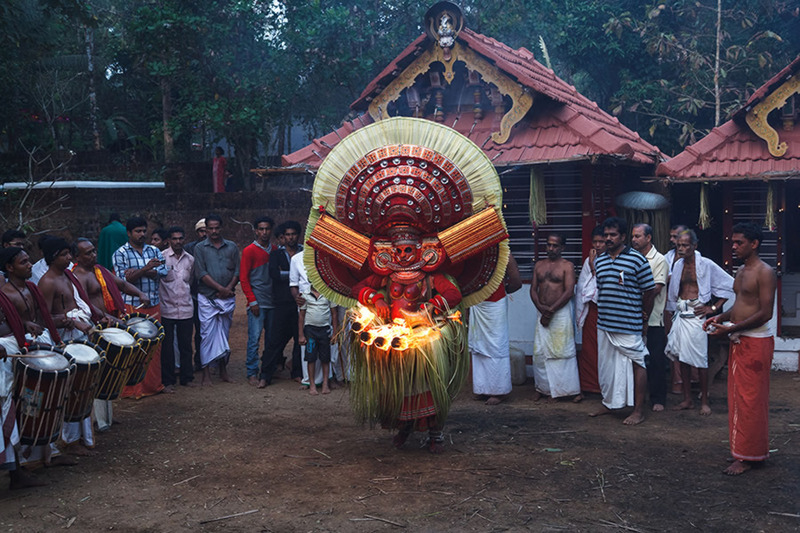 Some of the major disputes and caste conflicts are often settled by a specific representative of a particular deity during the theyyam performance. 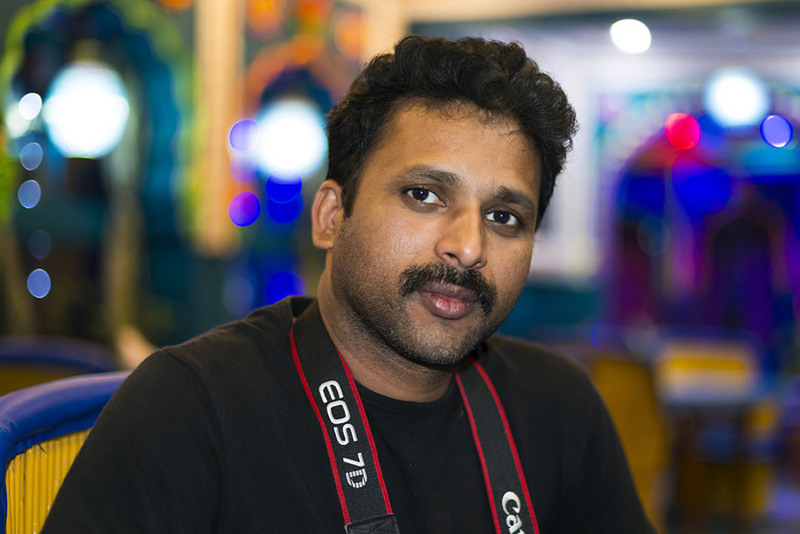 Hi, I am Shyjith Kannur from Kerala, presently working as an Art Director with a Dubai based ad agency. As a creative professional I am passionate about translating ideas through visual languages, and I had picked up the camera merely to add another dimension to my creativity. I started photography in 2011, and immediately set my focus to beautiful landscapes. After studying the art further and travelling extensively, I have newfound appreciation for environmental and story based photo series. My journey with my camera has been an interesting and ever evolving one and these explorations have unveiled to me the beauty of different global cultures, people and their daily lives. All the pictures in this post are copyrighted Shyjith Kannur. Their reproduction, even in part, is forbidden without the explicit approval of the rightful owners. Chanced upon your blog while trying to learn about Theyyams. I was curious if there is any book in English about the myths and legends associated with various Theyyams. I cannot read Malayalam, so searching for an English one. Kindly recommend, if you are aware of any books related to this artform . Also intrigued to know more about the lives of these artistes. 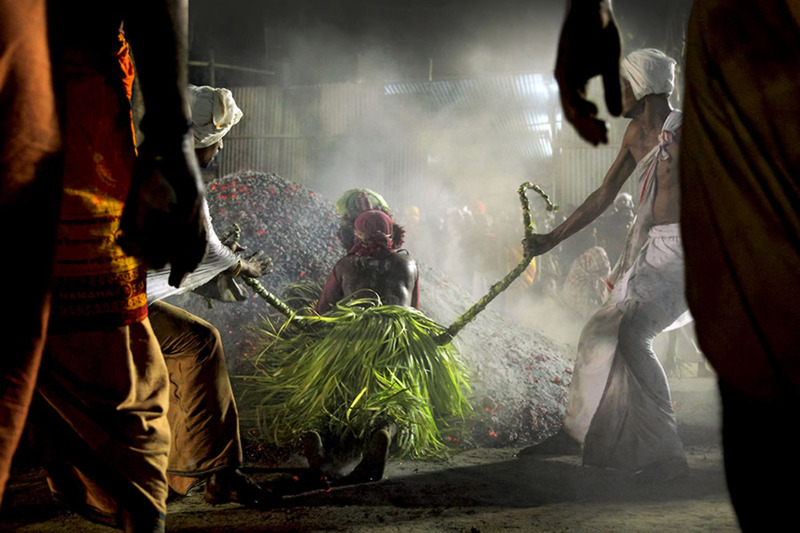 Had also heard that in Wayanad, the rituals are also associated with animal sacrifice. Is that true? Very beautifully composed photo story. And the captures are amazing too !! Photography Tutorials For Beginners: 10 Adobe Lightroom Tips You Should Know!